MDC Alliance leader Nelson Chamisa, is going ahead with his rally scheduled for Kwekwe on Sunday, his first since he lost the July 30 plebiscite to President Emmerson Mnangagwa of Zanu-PF. Chamisa notified the police about the rally as is required by the law, but the Zimbabwe Republic Police (ZRP) refused to give him the go-ahead citing the recent outbreak of typhoid in Gweru which is about 67 kilometres away. Both cities are in Mnangagwa's home province of the Midlands. In response to the MDC Alliance's notification, Kwekwe police boss, chief superintendent Conrad Mubaiwa said: "There has been a typhoid outbreak in the province. Health officials are not allowing the public gathering". As of August 8, at least 10 people died in Gweru since the start of the outbreak the previous month. About 400 cases were treated at the time. 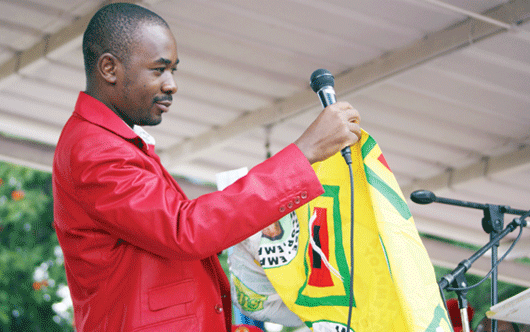 Chamisa, who has lined up a series of rallies throughout the country to consult his supporters on the way forward in the wake of the July 30 disputed elections, which he claims were rigged in Mnangagwa's favour, is adamant that he will proceed with the rally. The rallies are also meant to thank his supports for voting for him. Ironically, Mnangagwa is also planning to go around the country to thank his supporters. The MDC Alliance told the Daily News yesterday that police were out of order as they have no authority to block the rally. The party's national organising secretary Amos Chibaya said the programme will proceed as planned, saying there was no provision in the law that requires them to seek police permission. "We are proceeding with the rally as planned after we notified the police in terms of the law," Chibaya said. "The law does not dictate that we seek their permission but that we notify them, which is what we did. I am not sure where they are getting the information that they can decide to grant us permission or not". According to the Public Order and Security Act, a four-day written notice is required before conducting demonstrations and rallies. While the Act states that the notice should not be taken as application for holding of a gathering, government has made it subject to the interpretation of regulating authorities, who are senior ranking police officers. Chibaya accused the police of trying to hide behind the finger, saying it was duplicitous for the ZRP to attempt to prohibit the MDC rally when they have not stopped other gatherings taking place in the province. "Why have they not stopped the football matches that are going to be watched by thousands of people? Why have they not stopped people from attending churches especially those on open places where there are no toilets? These are tale tell signs of a regime that is panicking at the sight of people who are supposed to have voted for them. They know they are illegitimate," he said. Indeed, the Midlands Province will be a hive of sporting activities over the weekend. In Gweru, army side Chapungu are hosting Triangle today, in a tricky Castle Lager Premier League encounter. The mining town of Zvishavane, which is about 120km away, will host Mutare City, which will play against FC Platinum. The match is also scheduled for today. In the run up to the election, opposition political parties were for the first time allowed to campaign freely throughout the country, unlike in the past when rural areas were sealed off for them. In June this year, the ZRP even surprised themselves by approving an MDC Alliance demonstration to force the Zimbabwe Electoral Commission (Zec) to accede to their demands, which included being involved in the printing of ballot papers for the July 30 harmonised elections. Nearly a month down the line, the police were back to their old habits by refusing to sanction a march by the opposition against Zec, saying they did not have adequate manpower to monitor the demonstration. Chamisa garnered 44,3 percent of the vote in the just-ended polls, trailing behind the eventual winner, Mnangagwa, who polled 50,6 percent. The 40-year-old opposition leader disputed the result and took his case to the Constitutional Court (Con-Court), where he lost with costs. He is now touring the provinces to sound his supporters on the way forward. But with Chamisa indicating that he is not ready to give up his fight against Mnangagwa despite a Con-Court ruling upholding his victory, the country's security apparatus have seemingly retreated into their default mode — closing political space for the opposition. This comes hardly a month after the military killed unarmed civilians who were protesting against the Zec's delay in announcing the presidential results on August 1. The incident that left at least six people dead attracted wide condemnation from both the international community and local stakeholders, leading to the establishment of a commission of enquiry into the killings.